We recently purchased a 1908 C.F.Martin O-17 guitar which was in terrible shape. We have decided to do a complete restoration of this instrument, and chronicle the project here on the web site (keep in mind -- this project may take a year or more to finish). First thing, I thought I would show a few of the "Before" pictures. The peghead has, by my count, 19 rhinestones set into it, although it is otherwise in good condition and it appears to have the original gears, which appear to work well. The top has a great deal of wear and there is wood missing around the soundhole. The top also has a very bad cross grain crack, although that appears to have been repaired in a fairly acceptable fashion. Since we will take off the rib and the back, we will have good access to the inside to verify the quality of the repair and to correct it if necessary. The bridge is not original, or even a good copy, and it is oversize, so it will be difficult to restore the top to good condition if we decide to use an original size bridge. Moreover, it too has a compliment of beautiful decorative rhinestones. Not to mention the tailpiece. 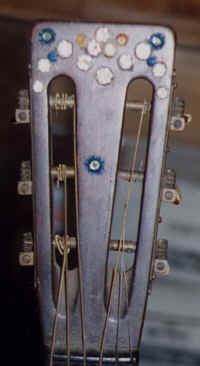 We have never seen the guitar strung to tension so we don't know why the tailpiece was installed. The treble rib is very badly cracked and was subject to a horrible repair. It is also missing wood. This will be the most difficult part of the repair. The back has some bad (and poorly repaired) cracks and has been loose from the ribs, and again, was very poorly repaired. I expect that we will have to remove the entire back in order to clean the glue and properly repair the back. .
How close to original do we want to go in our work? Do we replace or repair the treble rib? 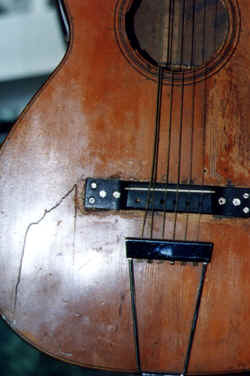 Do we restore the wood around the soundhole? Do we use an original size bridge (and touch up the top as necessary) or do we make an oversize bridge? How will we restore the finish? Do we reinforce the top for steel strings? Each of these questions has several acceptable answers. Our decisions will depend on a lot of things, including what the guitar looks like when we disassemble it. Always looking for a second opinion, I posed these questions to Frank Ford. 1. The rib on the treble side is very badly broken and even more badly repaired. Pieces are missing. The question is: Do we replace the whole rib or do we patch it so as to retain some of the original wood (perhaps 40% can be saved)? 3. Do we reinforce the top (bridge plate) so as to permit use of steel strings, or do we leave as is. 4. The original bridge is gone, and the replacement is oversize. In restoring the guitar do we make an "oversize" bridge or do we make it the original size and attempt to restore the damaged finish. 5. 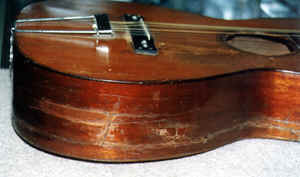 Large sections of the wood around the soundhole are missing. Do we leave it as is or do we attempt to restore the original shape (size) of the soundhole. It seems to me that each of these questions raise questions of both ethics of restoration, value of vintage guitars, players vs. collectors and, of course, issues of how to actually do the work. My initial thoughts on these questions is to lean towards the first option I have presented ¯ i.e. make it a usable instrument and worry less about total originality. Well, Charlie, that's quite a job you've got hold of! I agree with all your items, and I'd choose the first option on each of them, except the bridge replacement. 1. A new side is sure to be better looking than making a patchwork of the old one with so much damage. 2. The new peghead veneer is no big deal in my judgement, because the damage is not normal cosmetic wear; it's basically impossible to touch up that kind of damage. 3. The bridgeplate is a matter for discussion with the owner of the instrument (in this case, I guess that's you) and is an opportunity for the luthier to help decide whether the guitar can handle steel or if it is even a priority. Personally, I'd go for steel stringing because this critter will undoubtedly sound best with steel. Maybe you can do a really artful job with the bridge plate when the side is off. . .
5. I think the soundhole should be fixed to keep this guitar from being any uglier than necessary. 4. I'd try to work with the original bridge size and shape. In years past I replaced oversize bridges with oversize bridges. After all, the damage to the top finish had already been done, and it's lots more difficult to touch up finish than it is to make a bridge to cover it. These days, with the emphasis on originality of style, I'm replacing oversize bridges with standard ones wherever possible and suffering the touchup difficulties. I think the results look better that way. The only problem is that it's usually quite a bit more expensive. Now that these old timers are worth more money, we're able to stand the expense more often. How about a French polish refinish job on the face to correct the soundhole and bridge area? What with all the work this guitar is getting, I think originality of style should take precedence over originality of condition. That is to say I don't think there's much point in worrying about whether the top is refinished when there's new finish in so many other places and the touched up finish on the face is likely to look like just that, when a sensitive French polishing will make things actually look more original, much as the new side and peghead veneer will look more original than a bunch of patches would. So, that's the "BEFORE" on this instrument. As we begin (and hopefully complete) the repair, we will post photos and commentary here. I certainly hope for and invite comments and suggestions from visitors to this site.